Hot dogs are a processed meat product made by mixing chopped meat with various curing ingredients, flavorants, and colorants. The meat is then stuffed in casings, cooked, removed from the casing, and put in the final package. Although the technology for hot dog making was developed thousands of years ago, these meat products continue to be a popular summertime food. In fact, in America alone over 16 billion hot dogs are consumed each year. The typical raw hot dog is a pink, cylindrical-shaped piece of meat. It is about 1.6 oz (45.36 g) on average and contains anywhere from 0.175-0.245 oz (5-7 g) of protein. It also contains about 0.455 oz (13 g) of fat, 450 mg of sodium and 150 calories. Since hot dogs are meat products, they are an excellent source of nutrients including iron, zinc, niacin, riboflavin, and B vitamins. When hot dogs are made using pork meat, they are good source of thiamin. Since they are a pre-cooked food, they are less prone to spoilage than other types of meat products. This makes them one of the safest meat products available. Hot dogs are known by many different names including frankfurters, franks, red hots, and wieners. While there are many varieties of hot dogs, one of the most famous is the Kosher hot dog. These hot dogs are prepared in a manner, which follows 3,000 year old traditions that comply with Jewish religious practices. Specially trained Rabbis oversee the entire kosher hot dog making process. Ultimately, the main difference between a kosher and a regular hot dog is that kosher hot dogs do not contain pork. The technology for making hot dogs and sausages was developed thousands of years ago. This makes these products one of the oldest forms of processed food. The earliest record of a hot dog type product dates back to 1500 B.C. in Babylonia. Sausages were mentioned in Homer's Odyssey written during the ninth century B.C. These early forms of hot dogs were made by grinding up meat, stuffing it in animal intestine and cooking it over a fire. The exact origin of the product we call a hot dog is debated. Some claim that it was first developed in Frankfurt, Germany, in 1484. Others claim that it was developed in Vienna, Austria, and suggest that the term wiener reflects this point. Still others suggest that it was not developed until the late 1600s when Johann Georghehner (who was from Coburg, Germany) produced a sausage product known as the dachshund sausage. In 1852, a butchers' guild in Frankfurt produced a spiced, smoked sausage product which they named frankfurter after their hometown. It was slightly curved in shape and was often called the dachshund sausage. The product was brought over to America by Charles Feltman and Antoine Feuchtwanger. Feltman sold frankfurters and sauerkraut from a pushcart in New York's Coney Island. He opened up the first Coney Island hot dog stand in 1871. Shortly thereafter, he started selling the frankfurters with milk rolls, which were the precursors to hot dog buns. The buns that we use today were probably first introduced in St. Louis by Feuchtwanger in 1904. He was a sausage concessionaire who loaned white gloves to his customers to hold the hot sausages. Since most of his customers did not return his gloves he worked with a baker to develop a bun, which people could use to hold their sausages. In 1893, sausages became a popular food at baseball parks. They were first introduced in the St. Louis Browns ballpark and then spread to the rest of baseball. The term hot dog was coined in 1901 by a sports cartoonist named Tad Dorgan. He was at the New York Polo Grounds, where he had heard some vendors selling red hot dachshund sausages. This prompted him to draw a cartoon of a real dachshund covered with mustard on a bun. Since he did not know how to spell dachshund he wrote on the caption "get your hot dogs." The cartoon was a hit and the name persisted. The primary ingredient in hot dogs is the meat. The U.S. Department of Agriculture requires that meats used for hot dogs must be the same type of quality ground meat sold in supermarkets. While pork is most often used, other types may be used such as beef, chicken or turkey. Sometimes variety meats like livers are used however, the hot dog producers must clearly label the product with the statement "with variety meats" or "with meat by-products." The proteins and fats of which meats are composed are responsible for meat characteristics. For example myofibrillar proteins give meat its texture and structure. Myoglobin and hemoglobin proteins create the natural color of the meat. Fats in the meat give the characteristic flavor. During processing, the meat is mixed with a curing solution to improve the taste and increase the shelf life. A major ingredient in this curing solution is salt. It is used to make the meat easier to work with, improve flavor, and inhibit bacterial growth. Water is another component of the curing solution. It has a variety of functions including helping create the necessary meat emulsion and adding to the meat's juiciness. Sodium nitrite is included in the curing solution to retard the development of rancidity and stabilize the meat color. Curing accelerators such as sodium ascorbate or sodium erythorbate may also be added to preserve the color of the meat during storage. Constructed in 1936, the original Oscar Mayer Wiener mobile was a 13 ft (4 mj hot dog on wheels used to transport the hot dog chef known as little Oscar. Product promotion requires a willingness to "take a chance." The Oscar Mayer Wienermobile, used to promote Oscar Mayer hot dogs, was an audacious promotion that was successful. The original Oscar Mayer Wienermobile was constructed in 1936 by the company founder's nephew, Carl. It was a 13 ft (4 m) hot dog on wheels used to transport the hot dog chef known as "Little Oscar," featured open cockpits at the rear and center and was primarily driven in Chicago. The Wienermobile proved very popular and was modified over the next sixty years The car, currently on exhibit in Henry Ford Museum in Dearborn, Michigan, was made between 1950 and 1954 and is one of five second-generation Wienermobiles. It is made by the Gerstenslager Company, a custom truck and trailer manufacturer that modified a sheet bodies on a customized Dodge chassis. This Wienermobile is 22 ft (6.7 m) long, has glass over the cockpit, and weighs about 8,000 Ib (3,632 kg). This, along with the other four made around 1954, were stationed near key distribution plants and deployed for promotional events along with hot dog chef Little Oscar. The company continued to modify its successful promotional car and produced versions of it in 1958, 1969, 1988, and 1995. Kids still delight in sporting the Wienermobile (sightings of it often makes the local paper) and love to play kazoos in the form of Wienermobiles to the tune of "I'd love to be an Oscar Mayer Wiener." After the meat passes inspection, it is cut into small pieces and placed in a stainless steel mixing container. The container is equipped with high speed choppers, which can reduce the size of the meat pieces even further. The other raw materials including the curing ingredients, flavorings, and ice chips are blended in this container until a fine emulsion, or batter, is produced. The baiter is pumped into an automatic stuffer/linker machine, which stuffs the baiter into tube-shaped, cellulose casings. used to give hot dogs a sweeter taste. Flavoring is added to give hot dogs their characteristic taste. The flavorants may be natural or artificial, but typically a mixture of the two is used. Natural flavorants include herbs and spices such as pepper, nutmeg, ginger, cumin, and dill. Artificial flavoring compounds include organically synthesized esters, ketone and amino acids. Monosodium glutamate is an artificial flavor that is often used to intensify the flavor of the meat. Hot dogs can contain extenders, which are non-meat ingredients that increase the number of hot dogs that can be made from a set amount of meat and improve the nutritive value. Extenders come from plant and animal sources and include things such as non-fat milk, cereal, soy protein and whole milk. In the United States, all of the ingredients that are used in hot dog manufacture must be clearly labeled on the package. Once stuffed, the hot dogs are cooked. Their casings are removed and the hot dogs are vacuum-packed to preserve their flavor. batter has a smooth paste-like consistency, which makes further processing easier. 2 After the batter passes quality control checks, it is pumped into an automatic stuffer/linker machine. In this machine, batter is put into tube-shaped, cellulose casings. These casing are then twisted at precise points to produce a long linked strand of equally sized hot dogs. Most casing are removed later in the process however, some manufacturers continue to use natural casings, which remain on and are eaten along with the hot dog. This more traditional method of hot dog making is done by smaller manufacturers and tends to cost more. 3 The linked hot dog strands are then conveyed to a large smokehouse. Here, they are thoroughly cooked under controlled conditions. The manufacturer has the opportunity at this point to impart a different flavor on the hot dogs by using a variety of smoke sources. The cooking times vary depending on the recipe however, typically it takes about an hour. 4 When the cooking is done, the hot dog links are moved via a conveyor to an automatic peeler. During their trip, they are showered with water to help equalize their internal temperature. In the peeler, the cellulose casings are cut away leaving only the bare hot dogs. It should be noted that this step is skipped by manufacturers who use natural casings. 5 From the peeler, the individual hot dogs are transported to the packaging machinery. Here, they are lined up and placed on a plastic film. The films are folded and vacuum-sealed to preserve the hot dog's flavor and increase shelf life. Printed on the films are all of the graphics and required text needed for marketing. The sealed packages are moved to a stamping machine, which prints on a freshness date. They are next transported to boxing devices, put on pallets and shipped in refrigerated trucks to local supermarkets. The entire process of hot dog making from receiving the meat to boxing up the hot dog takes only a few hours. Quality control is an extremely important factor in any food processing facility. For health and safety reasons, the government regulates all of the raw materials that are used in the hot dog making process. The meat in particular is heavily regulated because the use of poor quality meat represents a significant health risk. Most manufacturers use only high quality meats to assure that their hot dogs are of similar quality. Upon receipt of the raw materials, they are checked for things such as pH, % moisture, odor, taste, and appearance to ensure they meet the previously set specifications. Additionally, the processing equipment is sterilized and checked before any processing can begin. During manufacture, the meat emulsion is continuously checked to assure that all the ingredients are put in at proper proportions. Since hot dogs are eaten, steps must be taken to ensure that they will have an appealing taste and be free from contamination. For this reason, tests similar to the ones run on the initial raw materials are performed on the final product. Hot dogs are a well-established product and the technology for their production has changed little over the last century. However, hot dog marketers are continually looking for ways to increase sales. A recent trend is the introduction of more nutritious hot dogs. These products may use poultry meat, which has inherently less fat, or meat substitutes, which have no fat at all. They are also made with less sodium. New varieties of hot dogs are also being produced such as the cheese-containing dog, a product which is injected with a cheese sauce during manufacture. From a production standpoint, hot dog making of the future should be faster. Each year designers of production equipment develop faster, more efficient machines. This will help to make the process more automated and increase the yearly output of hot dogs. LeMaguer, M. and Jelen, T., ed. 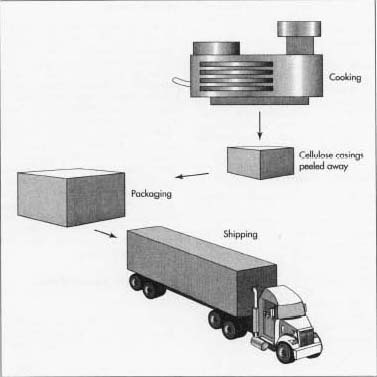 Food Engineering and Process Applications. London: Elsevier Applied Science Publishers, 1986. Macrae, R., et. al., ed. Encyclopedia of Food Science, Food Technology and Nutrition. San Diego: Academic Press, 1993. Burg, James. "Making More Healthful Meats." 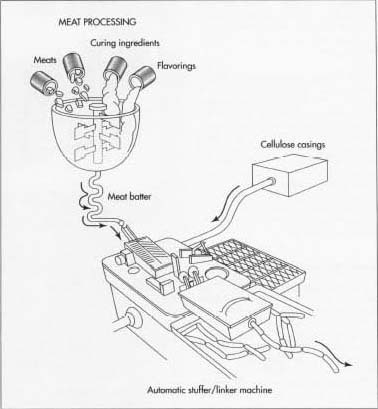 Food Product Design (March 1998): 32-58. National Hot Dog and Sausage Council Publications. I found the article very interresting and full of informatiom. 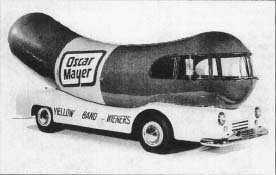 I always like Oscar Myer the best.Growing up remember the Wiener mobile coming to the local A&P Store where my parent use to shop.I have good memberies of my late Father taking the red wagon we had going to get the week grocery.I think I still have some of them hot dog whisles around the house. To this day I still like a Oscar Myer Hot Dog on a bun with mustard and relish. I read Susan's comment asking the question as to where one could go to have a hot dog manufactured using one's own recipe. I have been making my own sausages over the past year at home using semi-commercial equipemnt and slowly updating as time allows. I have also researched where I could have them made should I require a larger quantity than I currently produce, which is 30 lbs of sausage session. I have found small retail sausage shops locally (Manchester, New Hampshire) as well as specialty meat markets which produce their own sausages. These are potential sources depending on the amount of sausage you desire to make. One never knows, maybe your hot dogs are superior and they may very well want to not only manufacture but sell them as well. I have also founs a Boston meat packer who manufacturer's other peoples recipes and brands them accordingly, however, the minimum quantity per batch of sausage is 500 lbs./batch which exceeds my current needs. Who is the author and publisher of this article? I also need to know when it was published. Please help.